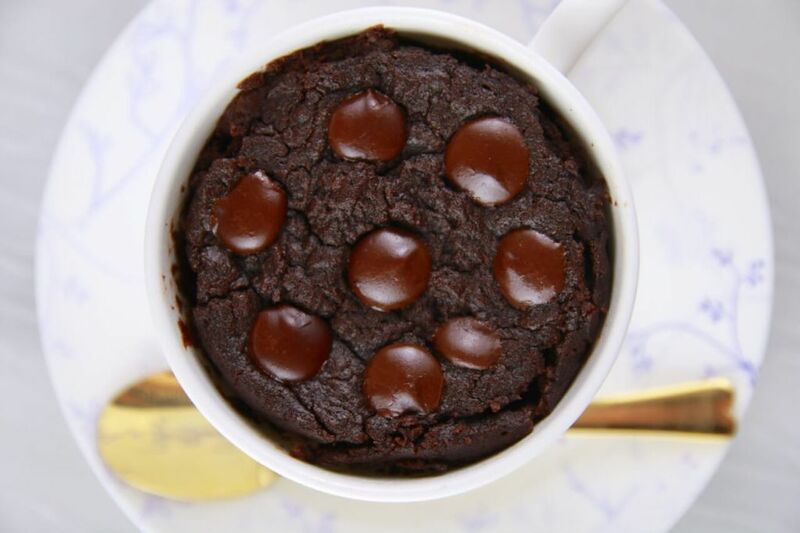 This indulgent Chocolate Mug Brownie is a single-serving of heaven just for you and possibly the best, fudgiest brownie ever (other than my Best-Ever Brownies). It’s my 1 Minute Microwave Mug Brownie! How Long Does It Take To Make A Microwave Mug Brownie? Everyone loves a Chocolate Brownie! Whether you are a chewy brownie lover or a fudgy gooey Brownie lover, at the end of the day we all love the same cake. The fact that you can mix it in less than 5 minutes and cook it in 1 minute seems too good to be true, but it’s not! My brownie in a mug is the real deal! Cakes made in the microwave are no longer dried wrinkled up cake at the bottom of your mug. My 100+ Mug cake recipes are sophisticated, delicious and something that you will not believe was made in a microwave in minutes. In addition to my Microwave Mug Chocolate Brownie, make sure to check out my all-new Nutella Mug Brownie! Take the 5 minutes it takes to make this mug cake to make your day or share it with someone else. Get 100 more Mug Meal recipes on my Gemma’s Mug Meals Collection page! Don’t forget to follow us on Facebook for more amazing baking videos! Nutritional value: The calories are high preserving due to sugar and oil. To lower these you can use more natural sugars and oil like coconut. GET my FREE Mug Meals e-book featuring 30 Mug Meals for Breakfast, Lunch, Snack, Dinner and Dessert including 10 exclusive recipes! Hi Gemma my name is Rosalind, I am from south Africa, kwazulu Natal. I tired almost all your recipes. This is a fasting season for me as I am catholic and I needed an egg free dessert to satisfy my craving and my word Gemma it was delicious, I added a ferrero inside instead of choc chips. So moist and yummy thank you for the wonderful recipe. Biggest fan from SA. WOW, yum, great job on this! Next time send us a photo! you should add milk to the mix so that the brownie is not dry. The milk will make it a bit more moist. Hi Gemma From n.ireland. I just wanted to say -These look AMAZING -but I’m on low carb!!! Wish we had the coconut flour or almond flour alternatives !! I really cant eat ordinary flours as the carbs pile weight on me like nobody’s it’s a post menopausal thing!! Ohh I feel I’m really missing out here!!!! Leave it with me and we’ll do some KETO mug cakes :). Hey Gemma! So I just this idea of making a “slutty brownie” in a mug, and I immediately thought of using this recipe and your chocolate chip cookie in a mug recipe. The only problem is, I don’t know how I can modify the recipe to have less batter and dough. Should I divide it in two? I think it’s a bit too much, even though my mug is quite large. Should I use a third or a quarter of the amounts of ingredients in each recipe? What do you think? Oh that is indeed very bold! I am not too sure Sofie, I would need to have tried it. The issue will be with the differing requirements of the cookie dough and the brownie batter. The idea of this recipe is to have a contrast in both the flavor and the texture, not too sure how that would work out in the microwave. A metal pan would be best for this when it is baked in the oven, to give the crisp finish to the cookie layer. I would need to experiment with this, I have added it to my list, thank you for the suggestion! Thank you so much for replying! I’m really happy to share my idea with you. I don’t know if it could work, you’re the pro, but I totally understand what the issues with this will be. It’s just that making actual slutty brownies takes soooo long and soooo many ingredients, I don’t really have time for that haha. If you ever try it, please let me know how it turns out. Stay awesome, you’re my favorite baking youtuber. I will 😀 Thank you again! Hi, yes you can make it less chocolatey if you like. Let me know what you think! I ended up making the coconut oil based one because I managed to find some in the cupboard – how I have all the ingredients for this and zero dairy/snack things I don’t know, but it paid off. I’m super happy, previous attempts with other recipes have resulted in fairly dry cakes. And as someone who puts far too much lemon/orange juice in lemon drizzle cakes, this was perfectly fudgey. I think also it may have been I spilled the vanilla extract into this instead of measuring it so may have put too much liquid in but I’ll take it. For anyone reading with a lower powered microwave than 1200W — mine is 900W and I just cooked it on full power for 1 minute 20 seconds, and with the coconut oil based recipe this was a good time for me. Your mileage may vary so test it at one minute and see, but 1m20s seems a good middle ground for testing. My brownie was super moist even though I microwaved it more than required. I used pancake mix flour. Is that the cause? I tried it and it turned out amazing!!! I added walnuts instead of chocolate chips and next time I will probably add a bit less cocoa but that’s just a personal preference. the consistency is perfect. haiii.. can i change the sugar to white sugar? Can I make a cleaner version with whole wheat flour? I’d love it if you could post more healthy mug cake recipes with chocolate. Hi, yes you can use whole wheat flour. It was good, way too much cocoa though. If I made it again, I’d probably use like half the amount. I love the chocolate chips in the batter, I might add more of those. Hi, yes feel free to adjust this to your taste, enjoy! Made the brownies this lunch. I can’t believe it only took 10 mins pax. I used to spend an hour if I wanted to make brownies. Um i followed the recipe completly. And it was not rising, it was just boiling. It was extremly liquidy, so i added a significant amount of flour and sugar and cocoa (all equal) mixed and tried again, it thickened but didnt make a brownie consistency. I let cool off and then i ate some of it and it was super grainy and still pretty liquidy. It didnt work at all. Help. Sorry for my late reply. So this is very strange that it would be watery. Can you double check the amounts that you used because something definitely sounds off. Either too much liquid or not enough dry ingredients. Hi, im not quite sure about that, i would follow the directions on the mix. I made this following the instructions perfectly, and I’m sorry to say it was disgusting. Wouldn’t turn into a cake consistency. was incredibly moist. Now feeling very sick and about to hurl, even though I didn’t manage to finish it. I wouldn’t recommend. That is FAR too much oil for a mug cake and far too much sugar. I have no idea what went wrong here for you, but something did! It sounds like you got the recipe a bit off. I am sorry this was not good for you, I hope you will try another recipe. HI! While I am not Gemma, you might try it with 1.5 Tablespoons of oil. It has been a success for us in the past. Hi! Thank you for this amazing recipe! My cake turned out delicious but undercooked around the edges. Perfectly cooked in the middle tho. Why could this be? that is odd! Microwave power levels do not equate to heat, but to time. It is worth understanding this. At full power the microwave is cooking at 100% of the time of the baking. At the lower levels it phases on and off, so at Medium high it is operating at about 75% of the time. At medium it will be 50%, etc. What is happening with the bake is that the heat, which is generated in the food, is allowed time to distribute. The defrost/low setting is on for about 30% of the time for instance, so that the food is not cooked, but defrosted. I hope this is not confusing, but it is worth thinking about it. So, I am wondering about the power level of your microwave? If it is lower than mine, you may have needed a bit more time. This is true too if it is an older appliance with older technology, these things change all the time, becoming more efficient as they develop. I hope this will help, I say give it a little more time, check after another 10 seconds and carry on until the top feels firm to the touch. How would I adjust this for altitude? I think time will be the adjustment here. You already know that water boils at a lower temperature at high altitude, and how it works depends on the altitude. I cannot be precise so I suggest you try it. One minute at first, then test it, a touch with your finger will tell you if it is baked, add 10 seconds and test again, carry on until it is done. I hope this helps, the power of your oven will also change how it bakes! Can this be made with gluten free flour and if so, what kind is best? Yes it can, in like bobsredmill brand, Enjoy! I didn’t have cocoa powder so in a pinch I ended up using one of those instant hot chocolate mix packets I always seem to have lying around and it still turned out absolutely delicious- the marshmallows in the hot chocolate mix arguably made it even better, lol. I’m definitely saving this one, most other mug cake recipes call for ingredients I tend to run out of very fast and at very inconvenient times so this is an absolute life saver when late night sweets cravings hit on the days I need to save my milk and eggs for breakfast in the morning. Good for you! love to hear that you rocked this up to suit your own need, well done you. The marshmallows!!!! what could go wrong? Hi, I am going to try this, but do you have a recipe for peach cobbler something simple. Wow, lovely idea! Let me know how you go! This is a brilliant recipe. I have been looking for one for a while now and I’ve finally found one which I’m satisfied with!! On top I put strawberries, whipped cream and sprinkles… Delicious!! Yay, i am delighted to hear that, that sound YUM! This was absolutely delicious, but what I be able to use yogurt instead of oil to lower the fat content? Yes, or applesauce, that will do it for you too. 😀 me too! I am delighted to hear that! Wow, so easy and delicious!! The only recipe change I made was subbing walnuts for the chocolate chips. It’s dense, moist, and very rich. Perfect to satisfy a sweet craving—and you only need a little. I got full before I could even finish all my brownie. Try this recipe! I usually love my brownies dark. But i found the recipe too dark even for my taste. I used unsweetened cocoa powder, 3 tablespoons of brown sugar packed. I also thought the oil can be reduced by like a tablespoon. It had a oily taste from all the excess oil(used sunflower oil). Had to Use double the sugar for the brownie to taste good. Thank-you so much for the awesome recipe, Gemma! This was soooo good and the amounts for the recipe ingredients will be so easy to do and remember. I did end up adding an egg and 1/2tsp of baking powder with the second batch. This made it more puffy and not as dense, but it was also really good. My kids loved making them. We’d do these again in a snap on another cold winter’s night. Is brown sugar packed when measured? Thanks! No, i do not pack my brown sugar. Hi there, in this recipe i would not suggest changing the flour but you could use coconut sugar. I have been craving for a fresh fudgy brownie for days and this recipe didn’t disappoint me. I can’t finish the whole thing though so a saved half for the next day. Definitely satisfied my cravings! Thanks Gemma for sharing this recipe. Good, good, good! Haha, I know that feeling, and really we do not want too much, just a taste at times will do it. Gemma thank you for the wonderful, easy and quick recipe. One doubt, the maximum power of my microwave is 850 W. So what should I do? Should I increase the time of baking? Also can I substitute all purpose flour with whole wheat flour? Whole wheat flour is not usually used in fine baking, like sponge cakes. If you wish to do this I suggest you try 1/2 white, 1/2 whole wheat, that will give the best chance of success. Choose a finely ground whole wheat too, or a fine spelt flour. It may also need a little more liquid, it is a different thing. Thanx Gemma for the tips and recommendations regarding the use of whole wheat flour. I shall definitely try it and let u know. Also thanx for the information regarding microwave power levels. Sorry to bug you with my doubts. So as indicated, at full power the microwave is cooking at 100% of the time of the baking. So does that mean that at the maximum or 100% power of the microwave, time of 45-60 sec as per the recipe should be sufficient? I would like to try this out with my junior high students. Could we use disposable coffee cups? I am just thinking about clean up and getting 30+ mugs for each class. Thanks in advance! Hi there, yes you can! Thank you! Any other recipes you think might be easy enough for a class of thirty 12-14 year olds to do in a 45 minute class period? Trying to cook with them but I have such limited resources. Thanks in advance! Hi there, my Best ever blondies and chocolate chip cookies are very simple and always a hit, i hope that helps. Enjoy! I have tried heaps of mug recipes and this is the first one ive had that actually worked. i only did two tbsp of cocoa powder and added a bit of milk. very sickly but good. I’m delighted to hear you enjoyed it! YAY i am delighted to hear that, next time send us a photo! This recipe is delicious. Thank you for sharing it. However I don’t see how it can possibly be 707 calories for one serving. Are you sure ? It is a high one Julie alright. It’s a real treat. Hi Gemma, thank you for all the wonderful recepies that you post week after week. These are very helpful for beginners like me. A quick question – can I make the mug recepies in a normal OTG(Oven Toaster Griller)? I just made this. It was delish as is! Perfect! Thank you for the recipe. thank you, I am delighted you made this recipe your own. great tip with the coffee! You are right too about the chocolate, the bitter sweet chocolate is not for everyone. You can bake really well with 50% cocoa solids chocolate, it is easy to work with, and not too sweet. It was SO delicious! The brownie was very fudgy and decadent. With strawberries, they taste even better! Julie, you have made my day! Can this be baked in a toaster oven? I don’t own a microwave. And if so, what temp and how long? Yes it can! I dont know about the timing though i might start with 4-5 minutes then check it. If its not done then go another few until its cooked. Enjoy! This recipe was really good, i loved it. in my taste i did less sugar and cocoa powder, because i don’t like it too overpowering with sweet. but other than that, the texture is wonderful and it is an amazing recipe overall. This is impossible! I think there is an issue with your oven, or the setting. If you baked this at 100% power for ten minutes it would be inedible, baked like a brick. 50 – 60 seconds will have it perfect at 100% power. Bake in a cup/mug wider at the top than the bottom for best results. Test your oven by boiling water in the mug or cup, one minute should heat a 6oz cup of water in a minute. Hi, this happened once to me but as Gemma wisely advises, I found that my mug was too narrow and tall. Ideally a shorter wider mug like a huge teacup for lack of a better term, would work. Keep in mind that microwave waves work on surface area. The smaller the surface area or batter open to the waves, the longer time. The greater the volume of the mug (how tall it is) will also result in longer cooking time or simply overflowing with uncooked batter. Hope his helps! WOW i am delighted to hear that, great job and thank you for the lovely message! Sorry, but this recipe is HORRIBLE. Super bitter, dry, and dense. If you do attempt it, I would recommend less cocoa powder and more sugar. I think this is a matter of taste and how you bake it. Other bold bakers have really enjoyed this recipe, I am sorry that you did not. Did you eat it with ice cream? It is rich so ice cream makes it perfect! Think i’ll use a little less flour and definitely less sugar. Other than that will deffo use this recipe again! Aw I’m delighted to hear that Holly :). Made this tonight for hubby and I, boy is this rich, tho it didn’t keep me from eating the whole thing. I used double dark cocoa with semisweet chocolate chips. I did reduce the sugar to one tablespoon and it was plenty sweet with a scoop of vanilla ice cream on top. I will be making this again. Thanks for a great recipe. I made your 3 ingredient peanut butter cookies yesterday and your best ever chocolate chip cookies are in my fridge to be baked off tomorrow. I am glad you found us too, and that you took the trouble to write this lovely review. Second time trying this recipe. both times they turned out like mush, kind of like really wet mashed potatoes. any tips? Not sure what happened here! This is the recipe, did you change something? I think I am missing a piece of information, do let me know.